We’re super excited to announce that LoyaltyLion is among the first partners to build a connector for Shopify Flow – a new feature for the ecommerce automation platform that was announced this week at Unite. Connectors allow apps to build triggers and actions that can start and end automated workflows in Flow. By applying unique combinations of triggers, conditions and actions developed just for Flow, our Shopify Plus merchants will be able to experiment with thousands of innovative ways of using LoyaltyLion and our third-party partners to maximise customer engagement and retention. Creating automated workflows with LoyaltyLion triggers and actions is quick and easy, giving you all the flexibility you need. You can do everything via Flow’s visual workflow editor, setting up workflows in minutes without relying on a developer to code or implement. LoyaltyLion’s connector gives you the ability to test, test and test again. 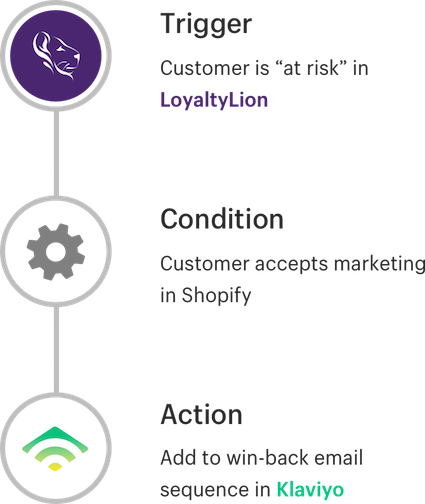 Experiment with unique combinations of triggers and actions and use LoyaltyLion analytics to find out which approach delivers the best ROI and conversion. Personalization can be difficult and time-consuming. Shopify Flow and LoyaltyLion work together to bring your more opportunities to engage with customers. You can quickly set up automated triggers and actions to communicate with customers in a unique and personalized way that makes them feel valued. What can you do with LoyaltyLion’s connector? Increase customer lifetime value and the likelihood of repeat purchase by encouraging customers who checkout as guests to become members. Emails letting customers know that there are points waiting for them can be sent via LoyaltyLion or an ESP. You may also want to award additional bonus points for those who return and create an account as a result. It’s five times as expensive to acquire a new customer as to retain an existing one. Increase customer retention and drive the next purchase by identifying ‘at risk’ customers, awarding them points and sending them an email to let them know they have points available. Emails can be sent via LoyaltyLion or an ESP and within LoyaltyLion you’ll be able to see how many of your ‘at risk’ customers make a purchase as a result. Give customers reasons to engage with your brand in between purchases by rewarding them for leaving reviews and making referrals via social media or Whatsapp. LoyaltyLion’s connector can be integrated with a number of our third party review partners. Why are we so excited about connectors for Shopify Flow? “Our goal is to free merchants from process, so that they can concentrate on innovating and delighting their shoppers – with Shopify Flow we’re one giant step closer to achieving that goal.” Charlie Casey, CEO, LoyaltyLion. Connectors for Shopify Flow is currently in merchant beta – Shopify Plus merchants can sign up for early access to the program before the full launch later this summer. Once you’ve been accepted into the beta and have our LoyaltyLion app installed, you can start using all the functionality of our connector. Click here to find out more about connectors for Shopify Flow.